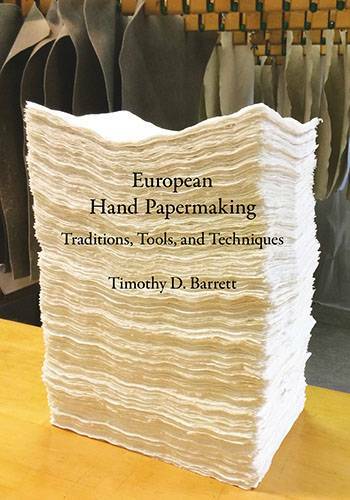 In this newly published book, Tim Barrett, internationally known authority in hand papermaking and Director of the University of Iowa Center for the Book, offers a comprehensive "how-to" book about traditional European papermaking. This excellent book is aimed at a variety of audiences: artisans and craftspeople wishing to make paper or to manufacture papermaking tools and equipment, paper and book conservators seeking detailed information about paper-production techniques, and other readers with a desire to understand the intricacies of the craft. European Hand Papermaking is the companion volume to Barrett’s Japanese Papermaking – Traditions, Tools and Techniques. Hardcover, 352 pages, 394 illustrations, 3 paper specimens.